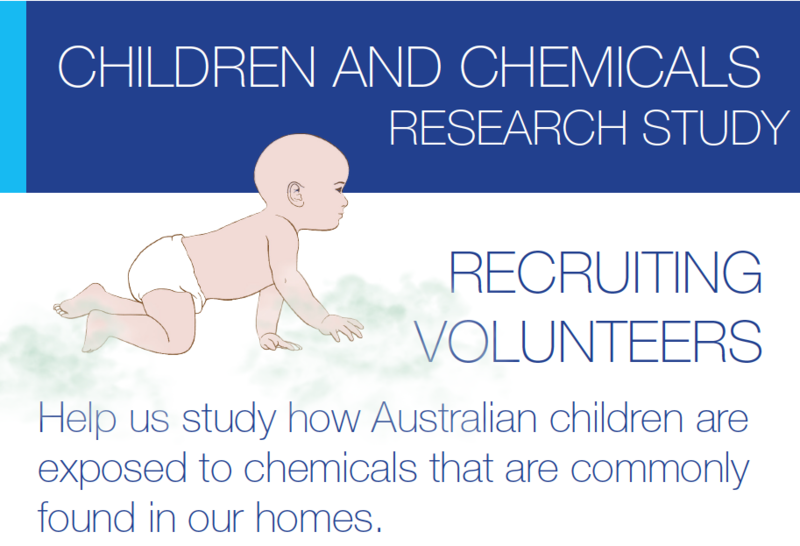 Kids and Chemicals in the Home – QLD's first research study. Kids and Chemicals in the Home – Queensland’s first research study. CHEP Research Study to design a questionnaire that will help parents assess children’s risk of chemical exposure in the home. This study is seeking volunteers! At a recent expo in Brisbane the ChemFreeCom team had the pleasure of meeting Karin English, a PhD student in Brisbane. Karen is a part of a team at CHEP, Children’s Health and Environment Program, whos’ aim is to design an online tool (questionnaire) that all families can use to see what chemicals their children may be exposed to. The information collected could then be used to figure out how to minimise children’s exposure to chemicals. ‘Kids and Chemicals in the Home Study’ : Identifying Ways to Minimise Children’s Exposure to Chemicals is a Queensland first study, investigating how patterns of chemical use in homes influence children’s exposure to chemicals. Why are researchers studying exposure of kids to common chemicals in the home? In recent years researchers have begun focusing more on how the chemicals that we might be exposed to in early life influence our health. There is concern that some of the chemicals that are commonly found in products in the home might disrupt the body’s normal functioning and development. Researchers at the Children’s Health and Environment Program at The University of Queensland are specifically interested in pest control products, plastic products and flame retardants, which are commonly found in electronics. In this current study CHEP want to figure out how well an online tool predicts exposure to common pesticides and flame retardants. The data collected will also provide CHEP with information that will help determine how much of these chemicals Australian children are exposed to and how they are exposed to these chemicals. The CHEP team are looking for volunteer families to assist. What does taking part in this study involve?